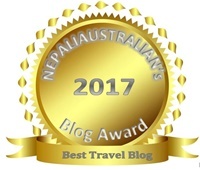 What a wonderful surprise to discover A Mindful Traveler had won the NepaliAustralian’s Best Travel Blog for 2017. Please check out the awards here. Thank you so much to everyone that voted, all the other winners and to you, who read and support my work. Much appreciated. Additionally, I have revamped the blog, and I do hope you like the new look! Congratulations, Lorelle. It is well deserved!! Yes, I heard and saw it was snowing in Rome. David’s Zia sent some beautiful pics of snow capped trees in her street! Well done Lorelle, and we’ll deserved. Congratulations. Well done Lorelle, you deserve this recognition. So happy for you Lorelle! It’s very well deserved. Keep up the fantastic work! Congratulations and hugs, Lorelle! I am so happy for you. Your blog deserves it and more. I am so happy to find a great travel blog!